Sharp introduces an oven within an oven within an oven. As a microwave oven, it's better for fish, vegetables, lasagna and frozen foods. It cooks so quickly, they taste fresh, flavorful and never dried out. And Sharp's exclusive Carousel turns the food so you don't have to. Which means you won't have to worry about being a microwave oven attendant. Or about "hot and cold spots" that can give you unevenly cooked food. As a convection oven, it's better for bread, cakes, pastries and pies. It circulates the air to cook faster than conventional ovens. And this constantly moving air surround the food, quickly heats the outer portions and seals in the natural juices. Food tastes more flavorful and looks as good as it tastes. Because Sharp's convection oven browns and crisps easy as pie. 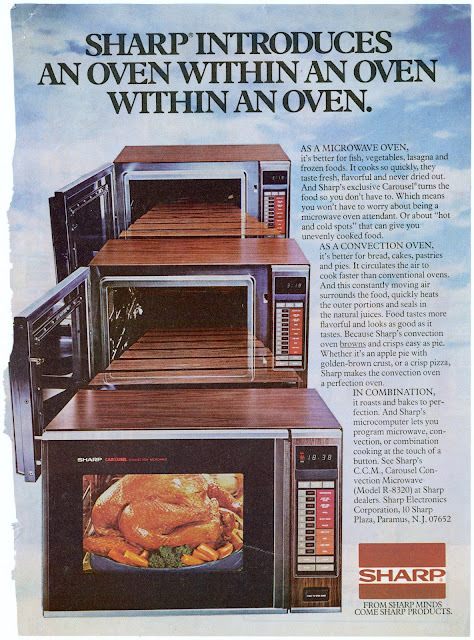 Whether it's an apple pie with golden-brown crust, or a crisp pizza, Sharp makes the convection oven a perfection oven. In combination, it roasts and bakes to perfection. And Sharp's microcomputer lets you program microwave, convection, or combination cooking at the touch of a button. See Sharp's C.C.M., Carousel Convection Microwave (Model R-8320) at Sharp dealers.